Charles R. “Charlie” Hansen, age 70, passed away Sunday, April 7, 2019. He was born in Galveston, Texas on September 30, 1948. He graduated from Ball High School and was proud to serve in the U.S. Navy during the Vietnam War. He was a boilermaker by trade and worked at Todd Shipyard for most of his career. He completely retired in 2010 to spend more time being “Pawpaw” to his 12 grandchildren. He was an avid hunter and cherished many memories of his time spent with family and friends at the Black Cat Hunting Club. All who knew him will sadly miss his colorful and humorous story telling. He was preceded in death by his parents, Charlie and Adeline Hansen. 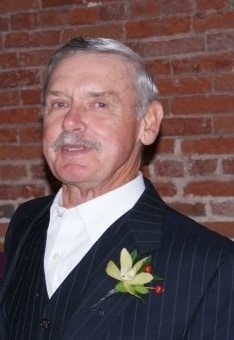 He is survived by his devoted wife of 44 years who took loving care of him, Sharon Rhame Hansen; daughter Jennifer Daugherty and husband Pat, son Russell Hansen and wife Mireya; 12 grandchildren, Chesney Garza, Emily Silva, Jayce Halloran, Trey Garza, Eric Silva, Tyler Garza, Chase Hansen, Charlotte Hansen, Carter Hansen, Grayson Daugherty, Everly Hansen, and Carlos Hansen; numerous nieces, nephews, and other family members. Sharon Hansen and family would like to thank Texas Home Health Hospice, especially Gloria Griffin. Visitation will be held Thursday, April 11, 2019 at J. Levy & Termini Funeral Home, 2128 Broadway, Galveston, from 5:00 P.M. to 7:00 P.M. Funeral services will be held on Friday, April 12, 2019 at 10 A.M. at J. Levy & Termini Funeral Home, with Father Edward Thompson officiating. Interment will follow at Galveston Memorial Park Cemetery. Pallbearers will be John Kovacevich, Rance Rhame, Ryan Shaffer, Gary Fesco, Jr., Michael Fesco, Brent Fesco, Tony Fesco, and Justin Fesco. Honorary pallbearers will be Paul Kovacevich and Roy Oscar Herod.